The Summer Solstice Music Festival, presented by the Edmonton Chamber Music Society, celebrated its 10th anniversary this year. The Festival used to concentrate almost exclusively on local musicians, but last year changed its format, bringing in a leading pianist (Charles Richard-Hamelin), and featuring one of the world’s great string quartets (the Fine Arts), alongside concerts by Edmonton’s most distinguished musicians. This year, then, had quite an act to follow, and the Festival stuck to the new formula. The Polish-Canadian pianist Krzysztof Jablonski gave a major recital, while the Festival closed with a concert by more local musicians from Alberta and British Columbia. In between, the featured quartet was, in many ways, the antithesis of the Fine Arts, for in contrast to that venerable institution, the Attacca represent the millennial generation of highly accomplished younger string quartets. Outside the main concerts, the Festival continued its tradition of encouraging young local musicians in pre-concert recitals, and in outreach and masterclass events spread across the city, from Callingwood Farmers’ Market to the CBC Centre Stage in the City Mall. However, it is perhaps worth pointing out that, in terms of chamber music, this was a strings and piano festival (including the young performers) with not a wind instrument in sight, except for the large Solstice Festival banner showing a cartoon clarinetist. This (apart from a couple of vocal recitals) was true of last year’s festival, too; perhaps the Festival might consider a little wind leaven in the future. The Attacca Quartet was formed at the Julliard in 2003, though only two of the original members remain. All the current members are in their early 30s, but already the quartet has achieved a considerable reputation. They have recorded the complete string quartet works of John Adams, played all 68 of the Haydn string quartets, and are currently engaged in a complete cycle of the Beethoven quartets, paired with works by contemporary composers inspired by Beethoven. 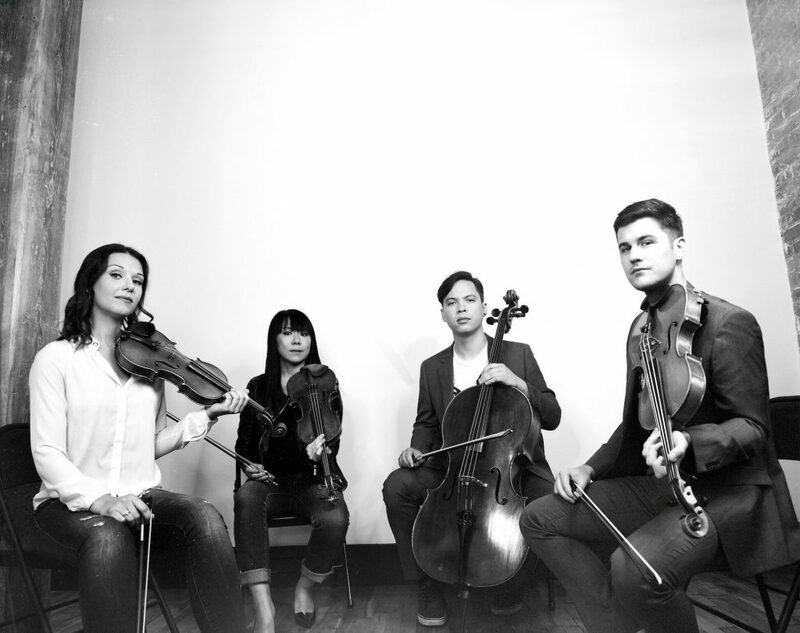 Their repertoire is happily eclectic, including contemporary string quartet repertoire and cross-overs from other genres, as one might expect from millennials. As their name suggests (attacca, the Italian for attack, means to move to the next section or movement instantly, without pausing), the Quartet’s chief characteristic is exuberant energy. At the same time, they are wonderfully disciplined and homogeneous, their technique exemplified by the way they can, in absolute unison, glide into the first note of a phrase as if conjuring it up from some ghostly ether. While it is perhaps invidious to pick out any of the players, nonetheless the quartet is built on the marvellous playing of the first violin, Amy Schroeder – what gorgeous tone, for example, in both the second and the final movement of the Mendelssohn String Quartet No. 2 in A minor, Op. 13 that they played at Convocation Hall on June 23. The emotional lodestone of the Quartet, however, seems to be cellist Andrew Yee, who wears those emotions all through his body language as well as through his bow. There were some really effective little touches in his playing – as in the little shivering phrases in that Mendelssohn, which made the whole ambiance of the piece seem fresh and new. This was a very effective performance, constantly illuminating the work. The Quartet had preceded it with a Canadian work, for the Festival was keen to include Canadian music to reflect Canada’s 150th anniversary. They chose Ottawa-based Kelly-Marie Murphy’s Dark Matter, inspired by the astronomical concept first postulated by Einstein. It was written in 2007 for the Banff International String Quartet competition, and it did rather sound like a competition piece. While never offending, it never really excited either, apart from the fairly obvious elements designed to show a string quartet’s worth. It’s in two halves, the first starting with hushed music suitable for a space movie sound-track and continuing in rather a cinematographic fashion, the second being much more rhythmic and energetic. I couldn’t help feeling that there had to be more arresting Canadian pieces to play – perhaps the far more striking and adventurous String Quartet No.3 (also written for Banff) by the Edmonton-born Juno-winning composer Vivian Fung, which I know is in the Attacca’s repertoire. The Attacca closed their Convocation Hall concert with a performance of one of the most complex of Beethoven’s late works, his String Quartet No. 14 in C sharp minor, Op. 131. Interestingly, this was the work that featured centrally in the critically-acclaimed 2012 Yaron Zilberman movie A Late Quartet, and the Attacca’s second violin, Keiko Tokunaga, worked on that film, coaching actor Philip Seymour Hoffman. It was a fine performance, played with reverence and affection, but it didn’t quite have the impact that they had achieved with the Mendelssohn. Perhaps significantly, they were at the most effective in the presto, where their youthful brio and energy enlivened the music. Otherwise they weren’t really intense enough, and I did wonder whether this most difficult of music to interpret simply does need the life-wisdom of long experience, the kind of area where the Fine Arts, for example, has always excelled. The day before (June 22) they had given the Festival’s traditional concert in the relaxed and informal surroundings of the Yellowhead Brewery, complete with beer on tap and excellent pub food. The Attacca obviously thrive in this kind of setting. They opened with John Adams, all energy, and they gloried in the first movement of Haydn’s Op.76 No.5 (they played the minuetto as an encore at Convocation Hall) – this is music they clearly love. In the second half (which I alas, couldn’t stay for) they played one of their party pieces, an arrangement of Star Wars music. And they gave the audience a splash of contemporary music in the first half. That contemporary music suggested that the quartet prefer music with a largely tonal base, strong rhythmic activity, and a touch of minimalism (all of which, of course, characterize the music of John Adams). They premiered a new work (there were no program notes, so I don’t know its title, other than it contained the words dreams) by first-violin Amy Schroeder, written the week before, that had more than a nod to Michael Nyman, a fluent and attractive work apart from the ending, which seemed to rather peter out. A piece by cellist Andrew Yee evolved into rather a beautiful passage that appeared to be based on (or inspired by) Mahler. Michael Ippollito’s Smoke Rings (in the version for quartet) is initially built on a pulsing repeated note that returns at the end – an atmospheric, almost visual work, that was quite striking. The Attaca described the music of the Pulitzer Prize-winning American Caroline Shaw as a ‘game-changer’ – highly debatable, inventive and attractive though her music is (and her cross-over into popular music is hardly a new idea). Valencia (named after the orange), with its minimalist elements and rhythms and glissandi, entirely suited the Attacca. It was an enterprising move for the Solstice Festival to bring in this quartet, especially as many of the audience had probably never heard of them. It worked, bringing a real enthusiasm to the core of the festival. The Festival opened with a recital by the Polish-Canadian pianist Krzysztof Jablonski, and for me this was rather the odd concert out. For a start, it had no Canadian content (which, in the context of the Festival, was a pity), and even though the program consisted of four of the masterpieces of the repertoire – and visually picturesque ones at that – there was something inherently predictable about the playing. Jablonski’s technique is not in question (all the works included bell passages, and in all four cases these were wonderfully played), but these were very laid-back, undemonstrative performances played from memory, Jablonski contemplating the inner working of the piano rather than the audience. That might have worked for some repertoire, but not for this. Debussy’s Children’s Corner missed its playfulness, and even the elephant was a very shambling one. There was really no subtlety of touch in the Ravel (Jeux d’eau and Gaspard de la Nuit), and Mussorgsky’s Pictures at an Exhibition really only came to vigorous life in the louder and bigger passages, and in the ‘Great Gate at Kiev’, where one could sense the antecedents of Prokofiev’s piano writing. The closing concert featured a clutch of more local musicians. The young and up-and-coming Canadian violinist Timothy Chooi played that arch-Romantic piece masquerading as a Baroque composition, Vitali’s Chaconne, and the third Grieg Violin Sonata (in C minor, Op.45). Some may remember his appearance with his older brother Nikki in an ESO concert in 2013. I wrote then: “has not (yet) achieved the same depth of violin colour [as his brother], but his virtues showed…: rock steady technique … the kind of virtuosic playing that delights audiences”. That violin colour has definitely deepened since then (a kind of lovely burnished walnut in the opening of the Grieg); just occasionally his technique faltered in the Grieg, where perhaps pianist Patricia Tao could have afforded to let the music breath a little more, but then one remembered he is still studying. Like his bother, he is a violinist to watch. Cellist Brian Yoon, who joined the ESO this February, gave a rather haunting short work by one of Canada’s best composers, Alexina Louie, Bringing the Tiger Down from the Mountain II for cello and piano. The title is derived from a Tai-Chi position, and it is a virtuoso work, including sensa misura elements (no bar lines, so the cellist can choose the shape) and double-stop glissandi. It is mostly wistful, but breaks out into more rhythmic energy, largely lyrical (at times using step-like progressions in the solo line like constellations in the sky), and the performance by Yoon and Tao was a convincing one. The concert closed with the ESO’s concertmaster, Robert Uchida, and the Assistant Principal Viola of the Calgary Philharmonic, Marcin Swoboda, joining Chooi, Tao, and Yoon, for what was a scintillating performance of Schumann’s Piano Quintet in E flat major, Op. 44. The colours of the string player were remarkably matched, and one would have thought they had been playing for years together, instead of being grouped jut for this festival. Chooi had suggested to the audience that it was a very varied concert, and on paper, maybe. But what was interesting was how much the pieces – apart from the Louie – had in common. They were all essentially salon works, a particular kind of 19th-Century Romanticism, and the concert conjured up those wonderful heavy velvet curtains, the deep colours of rich wall-paper, the ornate oil lamps with their tall glass chimneys, of the mid-19th Century urban salon. With such a passionate and convincing performance of the Schumann, this was a rousing way to end a most enjoyable Festival.